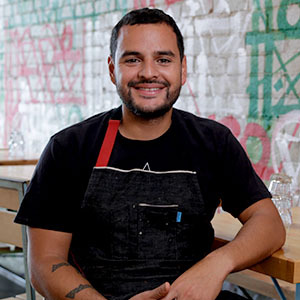 Born and raised in Leon, Mexico, Chef Fabian Gallardo has had a lifelong interest in creating. After moving from Mexico to New York City, he fell in love with food culture and began studying at the prestigious French Culinary Institute in Manhattan. He graduated with Grand Diplóme and a degree in Restaurant Management. After staging for popular restaurants L’Ecole and Café Boulud and starting his own catering business, Chef Fabian was offered the position of Chef de Cuisine at world-famous Vice Versa in New York. After 14 years at Vice Versa he left New York for California and is now head Chef at Petty Cash Taqueria. Petty Cash, Chef Fabian has taken the art of street tacos and "semi-authentic" Mexican cuisine to a new level, serving wildly creative combinations like guacamole with sea urchin, savory churros, and cauliflower nachos. Food & Wine awarded Petty Cash the title of Best Tacos in the United States for 2015 and Eater included the restaurant in their list of 38 Essential Restaurants in Los Angeles. Make use of simple, seasonal ingredients in this vibrant springtime quesadilla. This taqueria staple uses pork marinated in a flavorful sauce of achiote paste, pineapple juice, apple cider vinegar, and spices to create delicious tacos every time.